Gal Gadot, Carla Arellano, Laurie Zaks and Justin Timberlake pose onstage at The Hollywood Reporter's 2017 Women In Entertainment Breakfast at Milk Studios on December 6, 2017 in Los Angeles, California. It wasn't Angelina Jolie or Jennifer Lawrence who got the most rousing applause at the Hollywood Reporter's annual Women in Entertainment breakfast on Wednesday. It was a college freshman named Carla Arellano. 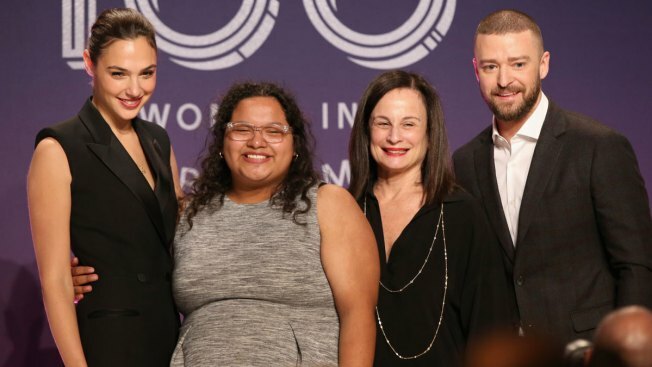 The Loyola Marymount University student received a standing ovation and brought a room of Hollywood heavyweights to tears as she accepted a full-ride scholarship from "Wonder Woman" star Gal Gadot. Arellano's emotional acceptance speech made Gadot and fellow presenter Justin Timberlake teary eyed. The 26th annual breakfast celebrating the trade publication's Power 100 ranking of women in the entertainment business included presentations of $1 million in college scholarships to girls from underrepresented communities in Los Angeles. Jolie gave the keynote address at the event Wednesday at Milk Studios. Lawrence accepted the Sherry Lansing Leadership Award.